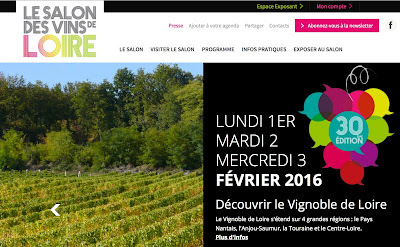 The First Salon des Vins de Loire was in 1987 and to date it hasn't missed a year since not even following the terrible frost of April 1991. Despite some voices saying that it should be called off the 1992 edition went ahead. My first Salon was in January 1990 and I have been to every edition since. The biggest threat the Salon now faces is Prowein, which has grown enormously over the last decade and a number of significant producers have decided to opt for the Dusseldorf and miss the Loire Salon. Late in the day the organisers of the Salon found a place and a formula for organic La Levée de la Loire last year. This year they have added a Demeter (biodynamic) fair as well. They have also included a section that highlights 'Young Producers', which is good news. Monday attracted a good crowd and my impression was that this first is that this edition is busier than last year. Predictably Tuesday was quieter and Wednesday very calm but good news for those of us who want to taste at the most popular stands but don't want to fight through the crowds. Châteaumeillant: up to 25 growersChâteaumeillant, Georges Sand country, has a strong claim to be the most isolated of Loire appellations. Quincy and Reuilly are the two Loire appellations closest to Châteaumeillant – just under 70 kilometres away for Reuilly and just over 70 kms for Quincy. In both cases it's an hour's drive away or more. Despite being isolated the appellation, which was promoted from VDQS to AOC in June 2010, has undergone a revolution in the past five years. In 2010 there were just four or five producers with the Cave Coop counting for an important part of the small production of Châteaumeillant. Since then, due to the closure of the Co-op some two years and a number of producers selling up or retiring, the number of producers has jumped to 25, although the area under vine hasn't increased significantly. A number of the new producers have come from Quincy, an all white appellation, attracted by the possibility of making red and rosé to augment their portfolios. Quincy producers, who have moved into Châteaumeillant, include Lecomte, Roux, Jacques Rouzé and Domaines Siret. Joseph Mellot also has a small parcel in the AC. Ludo and Sophie Ragot have sold their fine Café de la Promenade in Bourgueil with the new owners taking over in March. Having handed over the Château de Tracy (Pouilly-Fumé) vineyards to his sisters, Comte Henry d'Assay has set up a négociant business – SAS Comte Henry d'Assay. After some 20 years this is expected to be the last Salon des Vins de Loire that Gérard Pelletier will be welcoming vignerons, importers and press to his excellent restaurant – Le Relais. At the age of 62 Gérard has decided to embark on a second life. Thank you Gérard and we wish you a long and enjoyable retirement.